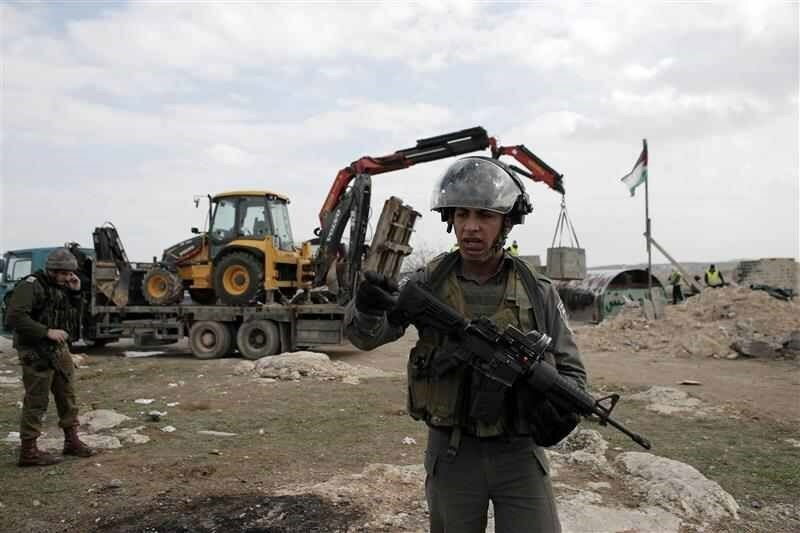 Israeli Occupation Forces (IOF) used military bulldozers to raze on Wednesday morning a number of makeshift structures in Ein Karzyielia hamlet in the occupied northern Jordan Valley. Palestinian activist against settlement Hamza Deireyeh told the PIC reporter that the IOF, in military patrols, stormed the area at seven o'clock in the morning, evacuated the structures of its residents, and razed three makeshift homes and three barns. 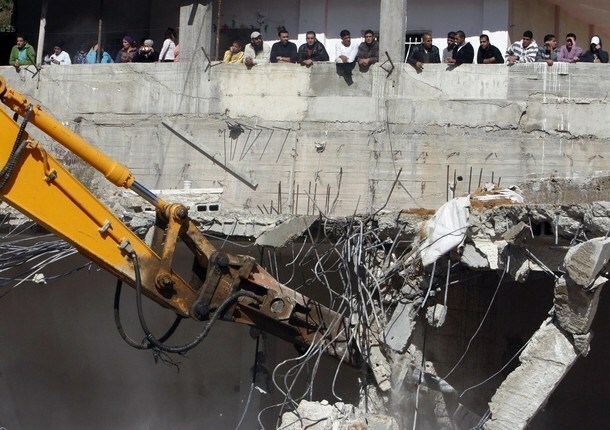 The PIC reporter said that the structures demolished belong to three Palestinian families. Israeli Occupation Forces (IOF) raided Wednesday morning Palestinian lands to the east of Rafah, in southern Israeli-besieged Gaza Strip. 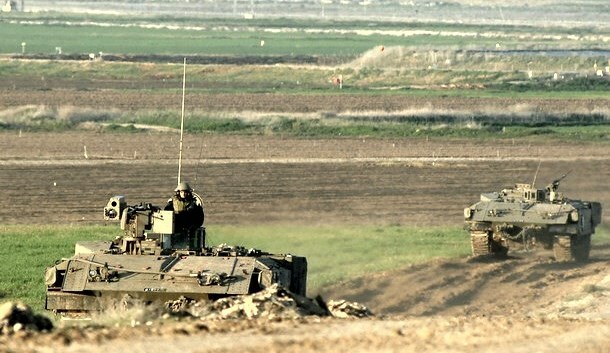 Local sources told the PIC reporter that four Israeli military bulldozers advanced into the southern Gaza Strip land for a limited distance estimated at 200 meters. The Israeli bulldozers entered from Sofa military checkpoint, east of Rafah, and started leveling and razing farmers’ lands. The IOF has been conducting incursions and bombardment targeting the eastern outskirts of the blockaded enclave despite signing a ceasefire agreement in August, 2014 following 51 days of brutal aggression. For more than five months, Yousuf Abu Odeh's boat was confiscated by the Israeli naval forces along with scores of other boats as part of the Israeli punitive policy against Gaza fishermen. Abu Odeh told the PIC reporter: "My 22-meter-long launch trawler boat was confiscated by the Israeli naval forces on 22nd September and the fishermen who were on board were arrested including my son Muhammad. They were released later on and the boat was towed to a port under the Israeli control and remained confiscated until last week." According to Abu Odeh, confiscating the boat deprived 60 fishermen from their only source of income and worsened their economic conditions already exacerbated by the siege. Abu Odeh was lucky enough to get his boat back, but there are scores of other fishermen still waiting for the release of their only way of making a decent living. Two fishermen, Jihad and Sha'ban, said that the Israeli naval forces chased them, arrested them and confiscated their boats almost a year ago. They were released hours later but their boats are still confiscated until now, they added. 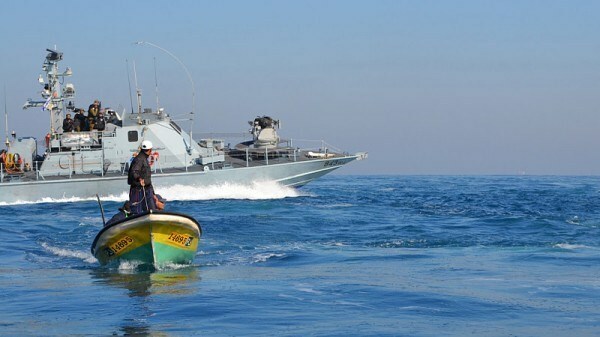 Engineer Jihad Salah from the Fisheries Department in the Ministry of Agriculture in Gaza affirmed in a statement to the PIC that the Israeli navy is currently detaining 65 "Hasaka Motor" fishing boats along with their fishing nets. He charged that the Israeli occupation authority is adopting this policy to starve the fishermen and their families and to deny them their only source of income as part of its economic strangulation of Gaza economy. Nizar Ayyash, chairman of the Palestinian Fishermen Syndicate, said in a statement to the PIC that 65 to 75 "Hasaka Motor" fishing boats with their fishing nets have been confiscated. He highlighted that the Israeli navy is carrying out many violations against the fishermen including shooting, killing, arresting, interrogating, torturing, and prohibiting fishing in the areas rich with fish other than confiscating boats. Ayyash pointed out that for four years now; the Israeli navy has been confiscating boats and keeping them at Israeli ports, which lead to damaging the boats and their motors. He recalled that there are about 3,500 fishermen in Gaza and the number of their families' members is more than fifty thousand. The price of the small boat is about ten thousand dollars, and the big boats about 150 thousand dollars. Israeli authorities, on Tuesday, sealed off a stone-cutting factory and seized a lorry in the town of Beit Ummar, north of Hebron, according to local sources. Mohammad Awad, spokesperson of the People’s Anti-Settlement Committee, said an Israeli army force, accompanied by staff from the Israeli Civil Administration, broke into the area and ordered the factory’s owner, Jamil Tarwa, and workers to leave. The soldiers and the Civil Administration also seized a stone-loaded truck, which was present at the factory. The workshop was set up and officially licensed in 1971, said Awad, who was also assaulted by the Israeli soldiers while he was taking photos of the incident. WAFA Palestinian News & Info Agency further notes that the stone and marble industry is strategically significant to the Palestinian economy and is considered the biggest industry in terms of the number of companies, sales and employment rates. According to the Union of Stone and Marble Industry, the industry supports about 15,000 - 20,000 direct jobs and generates about $60 million of exports annually. It is spread over the West Bank, but is concentrated in the districts of Hebron, Nablus and Jenin. Israeli police on Tuesday destroyed thousands of acres of wheat, barley and other cereal crops in the Palestinian Bedouin village of Rakhama, locals told Ma'an News Agency. Local resident Ali Freijat said that 14 tractors, escorted by over 50 Israeli police vehicles, arrived early Tuesday and began leveling the land. "This is vandalism through which they plan to displace the Bedouins from the Negev so as to create a Jewish state free of Arabs. However, my message to them is that if you turn over the land a million times, and if you demolish our homes a thousand times we will continue to live on this land and won't allow any body to take it from us." The land that was leveled was granted by the Israeli state to compensate for the loss of land resulting from forced displacement in 1954, Freijat said. "Since 1983, there have been deliberations over our ownership and our right to this land, and in 2007 the supreme court decided that they (Israeli authorities) should reach a settlement with us, but so far they haven't." "We are talking about 25,000 dunums (about 6,000 acres) of wheat, barley and other crops. They demand that we rent this land from the Israeli land authority but we definitely oppose that because by doing so we recognize that we have no rights to this land." Bedouins in Israel live in 45 unrecognized villages scattered primarily in the region between Beersheba and Arad. They are the remnants of the Bedouin population that lived across the Negev Desert until 1948, when 90 percent were expelled by Israel and the remainder confined to a closed reservation. In 2013, authorities said that the homes of the 1,500 residents of the village were to be demolished because the area had been converted into a closed military zone. 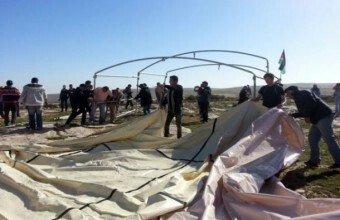 Israeli municipality bulldozers razed Monday dozens of acres planted with wheat and barley owned by Bedouins in Negev. Arab MK Taleb Abu Arar said that Arab citizens are subjected to an unfair racist policy in Israel. Demolition and destruction of lands and crops are main features of brutal dictatorship, he said. He called on local and international human rights institutions to firmly address Israel’s racial discrimination and religious hatred. The Islamic Movement’s MK Abu Arar said the Israeli authority is daily demolishing Arab homes and properties, while at the same time it is providing Jewish citizens with appropriate housing in Arab lands. High Commanding Committee for the Arabs in the Negev has earlier called for massive marches next Monday in protest against Israeli systematic demolition and destruction policy. The Israeli Civil Administration ordered Palestinians from the al-Jahalin community residing in the Khillet al-Raheb area to the east of Jerusalem to demolish their homes. Should they fail to do so, the homes will be demolished by the civil administration at the families' expense. These home demolitions are part of a broader Israeli campaign aimed at “relocating” Bedouin-Palestinian communities in the Jerusalem periphery, the so-called E1 area. Up to 2,800 Bedouins from 23 villages in the area are in danger of being forcibly evicated from their lands and transferred to a series of planned townships throughout the West Bank. The Khillet al-Raheb homes slated for demolition have housed the community since 1997. Daoud al-Jahalin, secretary-general of the Fatah movement in the community, said that the 14 targeted houses are home to nine families. Al Jahalin said that in such a case, 50 to 70 people will be forcibly rendered homeless. As part of the E1 settlement plans, Israeli authorities aim to relocate the the Jahalin, Kaabneh and Rashaida Bedouin-Palestinian communities from the mountains east of Jerusalem to Talet Nueima, to the north of Jericho. Guy Inbar, a spokesman for the Civil Administration, said in April 2013 that the civil administration is working together with the Palestinian Authority toward construction of 800 doweling units in the Jordan Valley. According to Inbar the construction plan is being drafted by a Palestinian company, which was awarded the project in a bidding process. 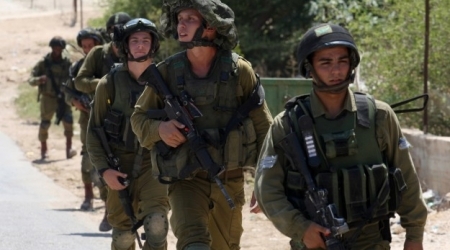 So far no construction has commenced, but Israel continues to distribute demolition orders. The Jahalin Bedouin community was deported from the Tal Arad region in the Negev to the West Bank in the early 1950s. After their eviction, the community lived a semi-nomadic life, moving between the Jordan Valley in winter, and the mountains to the east of Jerusalem in summer, to graze the livestock on which their livelihood depended. After the occupation of the West Bank by Israel in 1967, the Israeli military increasingly restricted the access of the community to grazing grounds, forcing them into the vicinity of the Jerusalem‐Jericho highway. Israel now aims to deport them from this area. 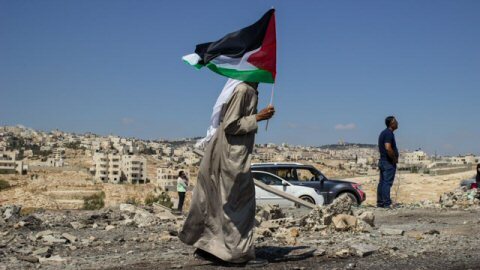 Dozens of nonviolent resistance activists gathered, on Monday morning, in Khallet an-Nahla area, southeast of Bethlehem, and marched while raising Palestinian flags to affirm their steadfastness in their own lands amidst Israel’s illegal confiscation of their lands, to build illegal colonies. Mohammad Mheisin, coordinator of the Popular Resistance Committee, said the protesters marched in the area carrying Palestinian flags, and posters containing names of villages Israel destroyed in 1948, and expressed their rejection to Israel’s ongoing violations of International Law. Mheisin said Israel is now trying to build Givat Eitam colony on 1700 Dunams (420.07 Acres) of Palestinian lands in the area, adding that Tel Aviv initially approved the plan in 2004. The official warned that this plan would block geographical contiguity in the area, and would also lead to further isolation of Palestinian orchards. He added that Israel's colonialist activities are meant to destroy any chances of a two-state solution, but the Palestinians will continue their popular resistance until liberation and independence. The Israeli occupation authorities (IOA) Sunday ruled the eviction of the Palestinian Shamasna family from their home in Jerusalem’s Sheikh Jarah neighborhood in favor of Israeli settlers. A PIC correspondent said the IOA threatened to throw all members of the Shamasna family out of their home if they do not leave by next Sunday. Earlier, in August 2013, a decision issued by the Israeli Supreme Court ruled for the forced eviction of the Shamasna family from the house in favor of Israeli settlers, Mohamed Shamasna said. The IOA claimed that Jews are the original owners of the house prior to 1948. The Jordanian Custodian of Enemy Property controlled all Jewish-owned houses in the wake of the Nakba. Transferred to the ownership of the Custodian of Absentee Property after 1967 Israeli occupation of eastern Jerusalem and the West Bank, the house was rented by the Shamasna family who were committed to covering all rental fees. An order issued by the Custodian of Absentee Property in 2011 ordered the Shamasna family to evacuate the house allegedly because the lease had expired since 2008. A set of documents and signed contracts proves that the Shamasana family has been covering all rental fees since the early 1970’s. But the Israeli court turned down all corroborations and appeals to protect the family from forced dislocation. The Wadi Hilweh Information Center said that Palestinian buildings in Wadi Hilweh neighborhood of Silwan district to the south of the Aqsa Mosque sustained fissures and collapses as a result of the Israeli tunnel diggings taking place underneath the area. The center stated on Saturday that widespread cracks started to appear in walls and floors of a residential building belonging to Bashir family and an accounting office belonging to Siyam family. The center warned that the Israeli underground diggings could lead to more damage to other Palestinian buildings in the neighborhood. The Israeli occupation authority in the holy city started its tunnel diggings beneath Wadi Hilweh in 2007. A Jerusalemite commission warned on Sunday of the continued Israeli excavations beneath the Old City in Occupied Jerusalem. They have led to cracks and collapse of walls and floors of two buildings in the town of Silwan south of the Aqsa Mosque. The Islamic-Christian Commission in Support of Jerusalem and Holy Sites said in a statement that the Old City of Jerusalem has many archaeological and historical sites that are threatened with collapse due to the continued Israeli excavations beneath them in addition to the Israeli policy of neglect and prohibition of restoration. 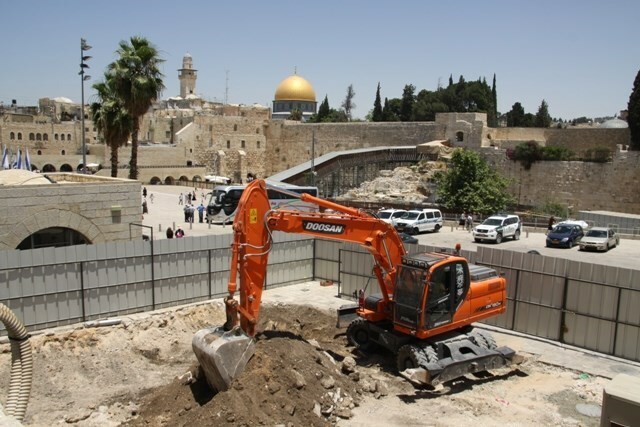 The commission urged the international community to oblige Israel to put an end to these excavations and to allow the restoration of the Old City. It also warned of the collapse of more houses over its occupants. “This is not the first collapse of its kind. It was preceded by many other collapses. Furthermore, perennial trees inside the Aqsa Mosque’s plazas had fallen. 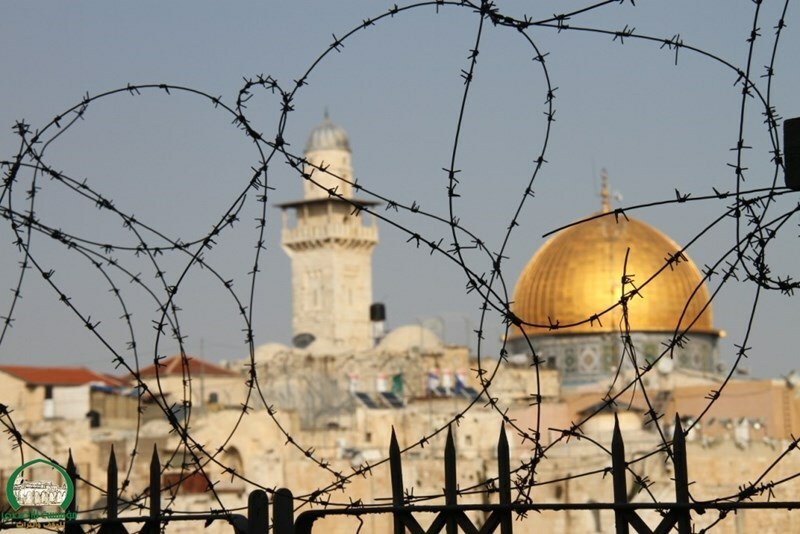 Many cracks and fissures have been witnessed in walls of dozens of structures in Occupied Jerusalem”, the commission said. Israeli civil administration employees, on Friday, demolished the "Jerusalem Gate" protest camp for the 10th time, a spokesman told Ma'an News Agency. Popular resistance committee spokesman Hani Halabiya said that Israeli forces raided the area, dismantled the camp and seized equipment. Halabiya said the camp was most recently rebuilt Thursday evening, highlighting that activists continued their protest in the street across from the camp after it was demolished. The Israeli occupation authorities (IOA) on Thursday knocked down Palestinian homes in Tel Arad village, south of the occupied Negev. Local sources said the Palestinian natives of Tel Arab became homeless after Israeli bulldozers escorted by police forces destroyed their homes and cultivated lands. The demolished homes belong to al-Zabarqa family, the same sources said, adding that the IOA seized the families’ belongings and forced them out of their homes. 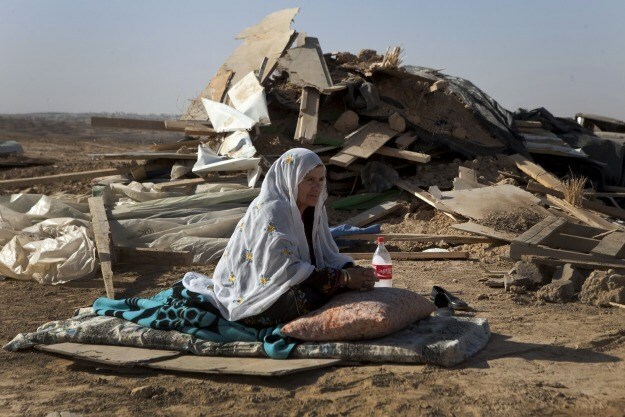 Sometime earlier, the IOA tore down six Palestinian family homes in Sa’wa village, in the same area, as part of a systematic ethnic cleansing policy pursued by the Israeli occupation government against the Negev people. Israeli Occupation Forces (IOF) Thursday morning distributed demolition notices for buildings and tents to the east of Yatta town in southern al-Khalil. 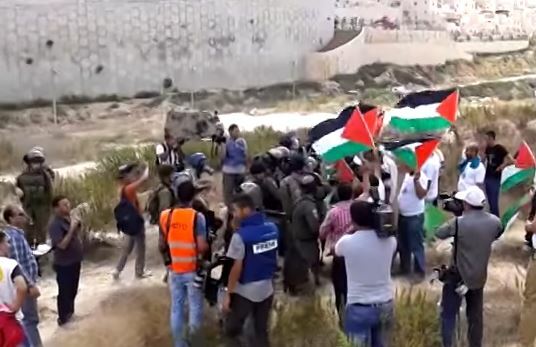 The Coordinator of the Popular Committee against Wall and Settlement, Ratib al-Jabour, said that the IOF escorted by Israeli Civil Administration teams stormed al-Majaz town and handed its inhabitants demolition notices. The notices included the primary school in the town which includes dozens of students from nearby villages and tents belonging to two Palestinian brothers. 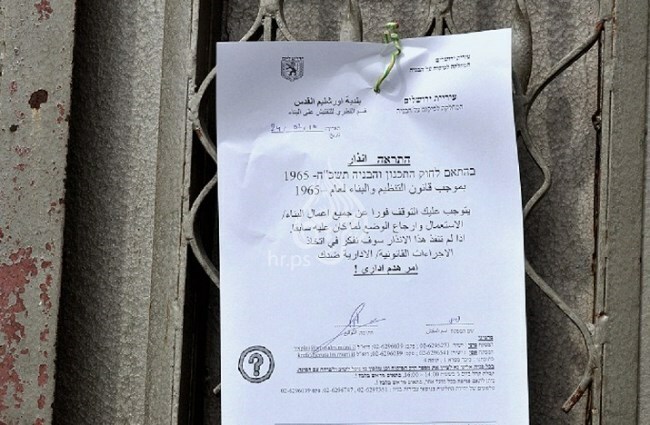 Jabour added that these notices are part of the Israeli plan to confiscate the land of Yatta town that sprawls over an area of more than 50,000 dunums.